I saw a story in CBC Winnipeg where because of the kind of weather we've been having, deer mice have found some comfort in people's cars. It seems like deer mice stinks and one woman in Inglis Manitoba discovered dead mice babies in the spare wheel of a vehicle. 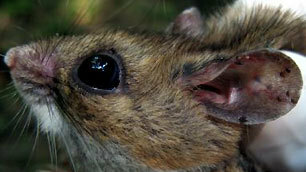 These animals spread deadly hantavirus so people are asked to stay out of those vehicles and have it check out by MPI. Imagine that. Also I saw that squirrels are trying to spoil the Christmas spirit by chewing up outdoor Christmas lights, ba humbug.